Alexander Farnese (Italian: Alessandro Farnese, Spanish: Alejandro Farnesio) (27 August 1545 – 3 December 1592) was an Italian noble and condottiero who was Duke of Parma, Piacenza and Castro from 1586 to 1592, as well as Governor of the Spanish Netherlands from 1578 to 1592. He is best known for his successful campaign 1578-1592 against the Dutch Revolt, in which he captured the main cities in the south (now Belgium) and returned them to the control of Catholic Spain. During the French Wars of Religion he relieved Paris for the Catholics. His talents as a field commander, strategist and organizer earned him the regard of his contemporaries and military historians as the first captain of his age. Alessandro was the son of Duke Ottavio Farnese of Parma (a grandchild of Pope Paul III) and Margaret, the illegitimate daughter of the King of Spain and Habsburg Emperor Charles V. He had a twin brother, Charles, who only lived one month. His mother was the half-sister of Philip II of Spain and John of Austria. He led a significant military and diplomatic career in the service of Spain under the service of his uncle the King. He fought in the Battle of Lepanto (1571) and then in the Netherlands against the rebels. Coat of Arms of the Farnese as dukes of Parma. He accompanied his mother to Brussels when she was appointed Governor of the Netherlands. In 1565 his marriage with Maria of Portugal was celebrated in Brussels with great splendour. Alexander Farnese had been brought up in Spain with his cousin, the ill-fated Don Carlos, and Don John, both of whom were about the same age as himself, and after his marriage he took up his residence at once in the court of Madrid. It was seven years before he again had the opportunity to display his great military talents. During that time the provinces of the Netherlands had revolted against Spanish rule. Don John, who had been sent as governor-general to restore order, found difficulties in dealing with William the Silent, who had succeeded in uniting all the provinces in common resistance to King Philip II. In the autumn of 1577, Farnese was sent to join Don John at the head of reinforcements, and it was his able strategy and prompt decision at a critical moment that won the Battle of Gembloux in 1578. Shortly afterwards Don John, whose health had broken down, died. Phillip appointed Farnese to take his place, both as Captain-General of the Army of Flanders, and as Governor-General. (His mother Margaret, who had been Governor-General, was appointed co-governor, but retired after four years.) Farnese was confronted with a difficult situation. Perceiving that his opponents were divided between Catholic and Protestant, Fleming and Walloon, he skilfully worked to exploit these divisions. By this means, he regained the allegiance of the Walloon provinces for the king. By the treaty of Arras, January 1579, he secured the support of the 'Malcontents' (the Catholic nobles of the south) for the royal cause. The rebels in the seven northern provinces then formed the Union of Utrecht, formally abjuring Phillip's rule and pledging to fight to the end. As soon as he had secured a base of operations in Hainaut and Artois, Farnese set himself in earnest to the task of reconquering Brabant and Flanders by force of arms. Town after town fell under his control. Tournai, Maastricht, Breda, Bruges, and Ghent opened their gates. In a war composed mostly of sieges rather than battles, he proved his mettle. His strategy was to offer generous terms for surrender: there would be no massacres or looting; historic urban privileges were retained; there was a full pardon and amnesty; return to the Catholic Church would be gradual. He finally laid siege to the great seaport of Antwerp. The town was open to the sea, strongly fortified, and defended with resolute determination and courage by its citizens. They were led by the famous Marnix van St. Aldegonde and assisted by an ingenious Italian engineer named Federigo Giambelli. The siege began in 1584 and called forth all of Farnese's military genius. He cut off all access to Antwerp from the sea by constructing a bridge of boats across the Scheldt from Calloo to Oordam, in spite of the desperate efforts of the besieged townspeople. The terms offered included the clause that all Protestants had to leave the city within four years. This disciplined capture and occupation of the town should not be confused with the bloody events of the Spanish Fury on 4 November 1576. Farnese avoided the mistakes of his predecessor Don Luis de Requesens. With the Fall of Antwerp, and with Mechelen and Brussels already in the hands of Farnese, the whole of the southern Netherlands was once more placed under the authority of Philip. At one stage Holland and Zeeland, whose geographical position made them unassailable except by water, were hard pressed to retain territory. The poorly supplied English forces, sent by Elizabeth I, were duly defeated by the Duke's. 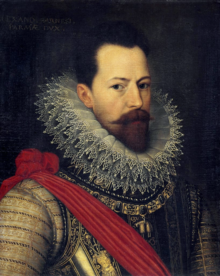 In 1586, Alexander Farnese became Duke of Parma through the death of his father; he never ruled, instead naming his son Ranuccio as regent. He applied for leave to visit his paternal territory, but Philip would not permit him as there was no replacement in the Netherlands. However, while retaining him in his command at the head of a formidable army, the king would not give his sanction to his great general's desire to use it for the conquest of England, at the time a supporter of the rebels. Farnese at first believed it possible to successfully invade England with a force of 30,000 troops, without significant naval protection, relying mainly on the hope of a native Catholic insurrection. Philip overruled him, and began the work that led to the Spanish Armada. As part of the general campaign preparations, Farnese moved against Ostend and Sluis. Sluis was taken in August 1587. The plan was that Parma's troops would cross the channel in barges, protected by the Armada. The Armada reached the area a year later, but poor communication between Parma and the Armada's commander, Alonso Pérez de Guzmán, 7th Duke of Medina Sidonia, made effective coordination difficult. Parma's troops were also threatened by the presence of Dutch forces in flyboats, who hoped to destroy the barges and drown Parma's army at sea. The English attack on the Armada in the Battle of Gravelines (1588), followed by an unfavourable change in wind-direction, made link-up impossible. After the Armada's defeat, Farnese broke up his camp in Dunkirk in September and went on to besiege the predominately English garrison at Bergen Op Zoom. After a siege which had lasted six week Parma was defeated and then withdrew to Brussels. Farnese was to have turned his attention back to the northern Netherlands, where the Dutch rebels had regrouped, but on 1–2 August 1589, Henry III of France was assassinated, and Farnese was ordered into France, in support of the Catholic opposition to Protestant Henry IV of France. This enabled the Dutch rebels to turn the tide in favour of the Dutch Revolt, which had been in ever deeper trouble since 1576. In September 1590 he moved to relieve Paris from the lengthy siege it had been placed under by Huguenots and Royalists loyal to Henry IV. On 20 April 1592 he repeated the same deed at Rouen, but was subsequently wounded in the hand during the Siege of Caudebec whilst trapped by Henry's army. Having escaped from there he withdrew into Flanders but with his health quickly declining, Farnese called his son Ranuccio to command his troops. He was however removed from the position of governor by the Spanish court and died in Arras on 3 December 1592, aged 47. Per Lèon van der Essen, Alexandre Farnèse, vol. I, p. 1, he had no illegitimate children. 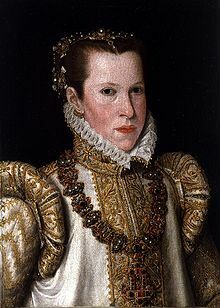 Isabella Margherita Farnese (Duchy of Luxembourg, 1578 - Lisbon, 1610), who in April 1592 in Rouen, married (some say there was no marriage) Portuguese João de Meneses, o Roxo (the Purple) (Penamacor, c. 1550 - Madrid, 1604), Lord of the Majorat of Penamacor, Colonel of the Spanish Army, Field Master in the Netherlands, only child and son of Simão de Meneses, with whom she had had one daughter and heiress, Leonor de Meneses. ^ Soen, Violet (2012). "Reconquista and Reconciliation in the Dutch Revolt: The Campaign of Governor-General Alexander Farnese (1578–1592)". Journal of Early Modern History. 16 (1): 1–22. doi:10.1163/157006512X620627. Wikimedia Commons has media related to Alessandro Farnese.